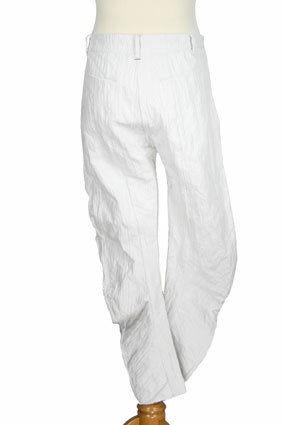 Masnada amazing banana shape trousers in dirty white with crinkled finish. Fantastic fabric with a slight stretch. Belt loops. Buttoned fly on a slight diagonal, with dark thick button at waist and ivory coloured buttons under placket. 2 rounded side pockets with single staple detail at top of pocket. 2 angle pockets at the rear. These trouser are beautifully tailored and in the most wonderful fabric, superb.